I love picture books that are interactive. I’m not talking about book apps, but physical books that ask the reader or the audience to do something. Not only are they fun for the audience, they’re also incredibly fun for the reader. Some of my favourite interactive picture books are the cat books by Viviane Schwarz (There Are Cats in This Book, There Are No Cats in This Book), that involve you blowing on the page to dry them off and throw balls of wool at them. I’ve just discovered a new favourite interactive picture book, called Open Very Carefully by Nicola O’Byrne and Nick Bromley. The book starts off with the story of The Ugly Duckling, but something shows up in the story that shouldn’t be there – a really big, scary CROCODILE! It seems that this crocodile likes to eat letters, words and even whole sentences, but you’ve got to stop him before he eats the whole book. You try rocking the book backwards and forwards to make him go to sleep, and you try shaking the book to make him fall out. Will it work or will he eat the whole book? Open Very Carefully will have adults and children in hysterics! Part of the humour of the book is in the way that you read it, putting the emphasis in the right place, and part of it is in the hilarious illustrations. At the beginning of the book the crocodile is looking very happy with himself, but that changes quite quickly when he discovers that he is wearing a very unflattering outfit. From the very first page children are engaged in the story and they’ll want to help you get rid of the crocodile. The interactive parts of the book are especially great for sharing one-on-one as these parts make children feel like they are important to the outcome of the story. The design of the book is wonderful too, especially the final pages and the back cover, which offers one final surprise for readers. 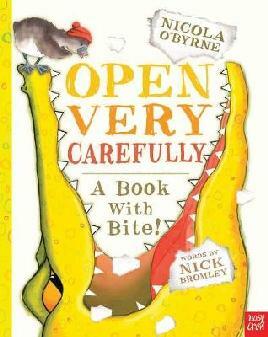 I will be reading Open Very Carefully again and again to preschoolers and school groups in my library. I’ll have to try and read it without laughing myself though.